Frances Flora Bond Palmer, American (born England), 1812 - 1876. Published by Currier & Ives, 125 Nassau St., New York, 1835 - 1907. Frances (Fanny) Palmer immigrated to the United States from England in 1844, shortly before journalist John O'Sullivan coined the term "Manifest Destiny" and the gold rush drew nearly 300,000 settlers to California. 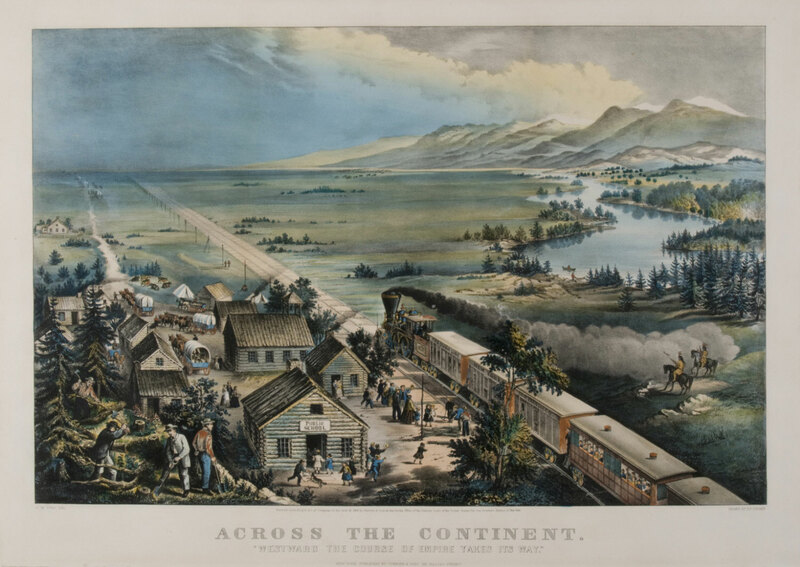 By the outbreak of the Civil War in 1861, she had become one of America's most prolific and versatile printmakers, her name appearing alongside that of Currier & Ives. Signed "F. F. Palmer," Across the Continent is her best-known work, demonstrating her artistic skill and sensitivity to the politics of her adopted country. A locomotive follows the mountain peaks West as it divides log cabins from unsettled wilderness. In the lower left, construction continues on a flourishing, well-populated town, promising renewal to a nation recovering from war. In the lower right, American Indians sit on horseback in the train's fading smoke, hinting at the old ways of life that are destroyed to make way for the new.